The Vale is a thinly populated frontier that stretches almost 250 miles east to west and averages about 70 miles north to south. Several small mountain ranges and dense forests form the vale’s borders. The scattered human towns and villages of the area grew up along the Dawn Way, an important east-west trade road linking the heavily settled lands that lie northwest across the Endless Plains with the exotic kingdoms and goods of the coastal lands lying to the southeast. Much of the Dawn Way was built by an ancient dwarf-kingdom that spanned the Wyrmsmoke and Giant's Shield Mountains more than a thousand years ago. While the dwarves are long gone, their roads, bridges, and cisterns remain in use to this day. After the dwarf-realm passed, the presence of various monsters and raiders kept traffic along the Dawn Way light for many years; few caravans dared the long and dangerous trek. Few humans lived in Elsir Vale during those years—only scattered settlements of druidic folk who left behind little more than grassy barrows and stone circles on the hilltops. 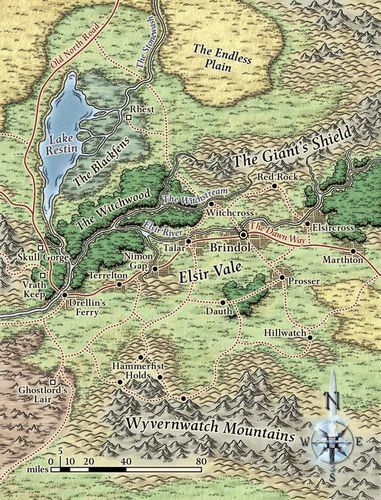 About five hundred years ago, the nearby city of Rhest came to control the vale and a large swath of land north of the Giant's Shield Mountains as well. Soldiers from Rhest secured the roads all the way to Dennovar and beyond, creating a safe passage for trade. More and more traders traveled the Dawn Way, and the kingdom of Rhestilor grew wealthy on the tariffs exacted from the passing merchants. Under the kingdom's shield, the towns along the Dawn Way—Stoughton, Talar, Terrelton, and the rest—grew up from tiny hamlets or lonely soldiers' posts to flourishing human settlements. The kingdom of Rhestilor eventually collapsed under civil strife, monstrous incursions, and magical blights. Almost two hundred years ago, the city of Rhest was burned by a savage horde of goblinoids. Although the warriors of Rhestilor killed many of the goblins and their kind, the city was abandoned and the already weakened kingdom broken. The locks and canals surrounding Rhest fell into disrepair, and the Blackfens swallowed the ruined city. In the years since the kingdom's fall, the towns of Elsir Vale have come to look after themselves. Most of the local lords still hold titles derived from the old kingdom of Rhestilor. 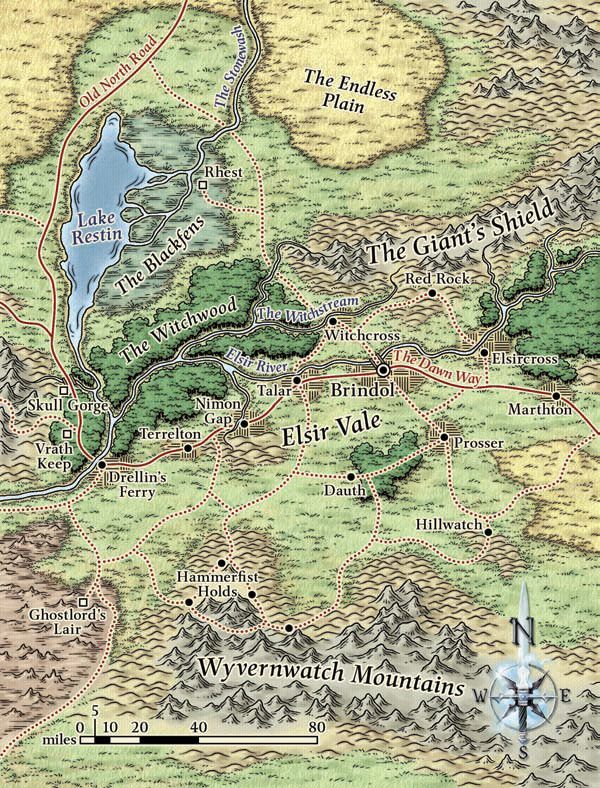 While everybody knows that the kings of Rhestilor are long dead, no new realm has arisen in the Vale.